Does the Common Core have a Hidden Agenda? Anthony Cody’s article from last year Classrooms of the Future: Student Centered or Device Centered offers a very important analysis, looking at the hidden agenda of Common Core and the technology industry. 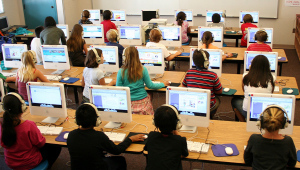 Anthony believes that the goal of “aligning” tests and curriculum with Common Core is to “standardize” education the way computers and other forms of technology are standardized. This helps to explain why Bill Gates has poured so much money into Common Core and testing. Think about your PC, all top-selling computers (with the exception of Apple) have the same standard design. That’s what allows Gates’s Microsoft company to maintain a global monopoly with their operating system. Whether your computer is made by Dell, Sony, HP, Samsung or Toshiba they are all configured to the same global industry standards, aligned with Microsoft Windows’ software. Whence comes this new-found concern? Can kindness win out as the new factor is college admissions decisions? This has been an interesting couple of weeks for college admissions, following an interesting year. You are currently browsing the CollegeDirection's Blog blog archives for February, 2016.